I woke up today and it's 70 degrees outside. It's a balmy Christmas, but I'll take it. I went to bed last night with tornado warnings--I can do without that. Sorry and sad to read about your health problems, I have them too, though not the same. I thought I was loosing some of my hearing in my left ear, which is a something that was bothering me, plus I always have ringing in my ears from working around heavy equipment and noise. My allergies have been on the war path. In essence, getting older. I guess there is some way to come to terms with age, but it's difficult at time. At least we still have our memories, and we'll take a few rewards when we can get them. From the sketch you left, I'd say you've still got it though it may take longer these days. 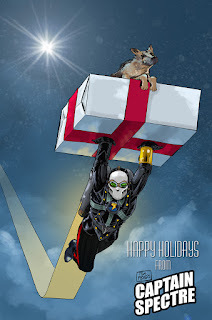 Have a good holiday. I was just thinking of you and wondering how you are doing. It is saddening to hear about you declining health, I was hoping you might have found some relief by now. Awesome Christmas gift, thanks! I am thrilled to see your awesome art again, and most of all, the Captain and Rocket. I hope you and your family have a great Christmas and I really hope you have a better year next year, you deserve it! Take care my friend, and get better! Yes we are still around!! Hope you feel better in the new year. Thank you for taking the time to create and share this inspirational image of the good Captain. It's always great to see your art! Still here reading in little ole Christchurch, New Zealand. 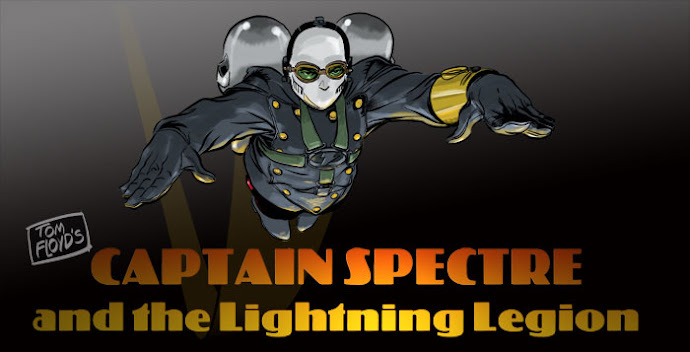 Its been a while my friend, hope to see more art and, more importantly, Captain Spectre!! !